We had a really great Pampanga food tour today. 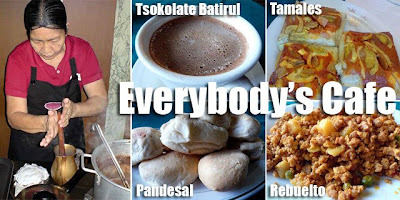 Breakfast was at Everybody's Cafe where we were served a genuine Kapampangan breakfast composed of tsokolate batirul, pandesal, tamales from Cabalatian and rebuelto. Panghimagas included sweetened saba with ice, and plantanilla (sweet egg crepes with latik filling) from the kitchens of Imang Salud. The group laughed in amusement when we said that breakfast was light. We passed by the Bacolor and Betis churches before proceeding to Bale Dutung in Angeles City, Claude Tayag's famous residence. On the bus, we served the group five gallons of buko sherbet which you can buy in Brgy. San Jose in San Fernando in a wooden vat! At Bale Dutung, aside from the usual appetizers which included crackers with buro, taba ng talangka and pesto dips, pako salad, lumpiang ubod and chicken inasal, we were served five ways of eating lechon! The first way was eating the skin with liver sauce. And they did it fiesta style, allowing the guests to skin the lechon on their own. The second way was Claude's own pritchon. 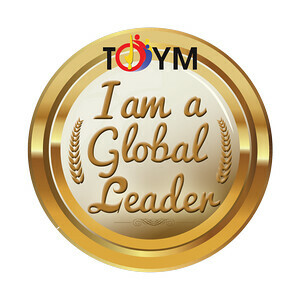 The lechon meat and skin was fried to a crisp and served with soft tortillas and a choice of tomato, onion, basil, kinchay, kimchi and oriental sauce for the filling. It was really good! Before moving on to number three, we were served begukan (made of pig's ears) and eggplant boats. 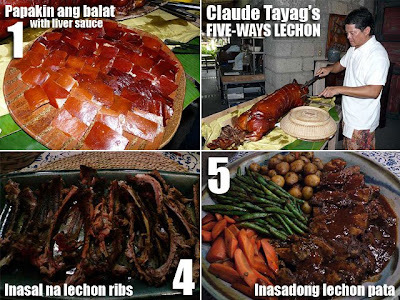 For number three, it was sinigang na lechon. We were told the lechon bones were thrown into the broth to give it more flavor. They then brought out grilled lechon ribs marinated in inasal sauce. That was really good! The last dish was inasadong lechon pata! To end our five hour lunch at Claude's, we were served halo-halo with the different Kapampangan ingredients which includes pastillas, leche flan, mais, saging and beans. The day did not end without our pasalubong for the group which included Imang Salud's ensaimadas and the inverted brazo de mercedes bites from Aurely's. Everyone told us to stop feeding them! Our next tour is on December 20 which is the day of the Giant Lantern Festival. So book now at info@ivanhenares.com if you want to join. It's PHP4,800 per head and this tour will extend up to the evening to watch the Giant Lantern Festival. i miss pampanga. i lost 10lbs since I left that hole. all i did there was eat.